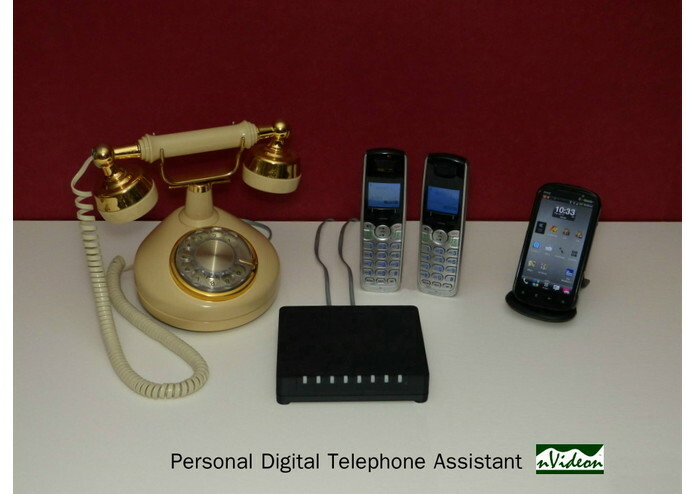 This submission describes a low cost personal digital telephone assistant (PDTA) for use in a home or home office environment that integrates and coordinates a consumer's (subscriber's) mobile phone, land line, and VoIP services for use with their home telephones. The PDTA answers and screens incoming calls much like a live receptionist. The PDTA uses patent pending techniques and processes to eliminate all unwanted robocalls and to strongly discourage calls from live salespeople, while allowing calls the subscriber wants (including wanted robocalls) to get through without hassle for the caller or the subscriber. During the time nVideon has been alpha testing the PDTA in a home environment , no unwanted robocalling machines have rung the test subject's telephone. Once an unwanted call from a live salesperson got through, but the test subject was able to send that call to voice mail without having to interact with the caller. The system can block specific phone numbers, but the test subject has yet to resort to this. The PDTA also provides a patent pending, intuitive, convenient way to dial by name using any standard push button or rotary dial telephone. The system is compatible with all existing telephones, wired telephone services, Bluetooth enabled mobile phones, and VoIP devices and requires no changes to the telephone system infrastructure.